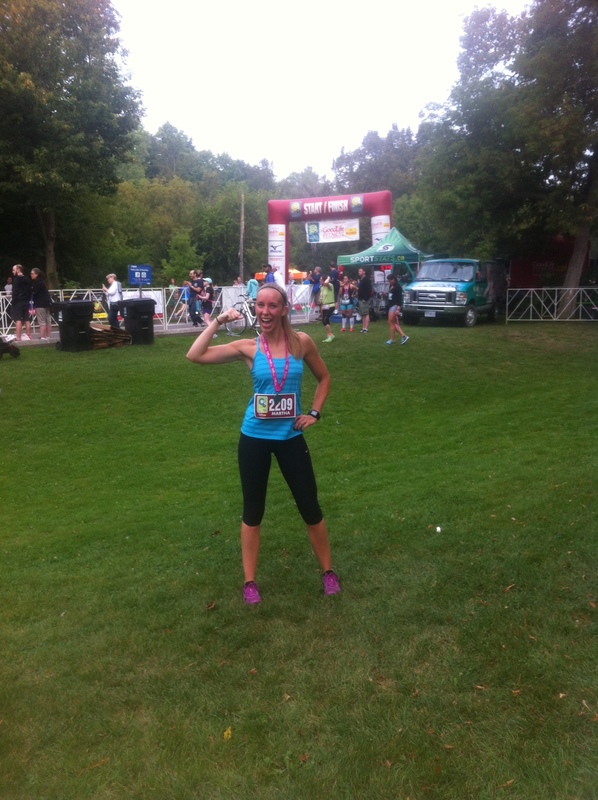 Run a smart race: debatable, but overall successful. Don’t get hurt: assuming no new injuries counts as successful. Get a sub 25 minute 5km: check. This past Saturday was another planned 5km race on a fairly flat, paved route through Sunnybrook Park. The weather was ideal, my knees were feeling good, and I was rolling into the park on a good night’s sleep. It was a perfect storm of racing conditions by my standards. My friend S and I only had to hit the porta potties about 6 times before we could consider ourselves officially ready to go. I just don’t know where women find the time to squeeze in a pre-race warm- up. My chase pack was down to one, but in a race of over 400 people, it is hard to feel like you only have one person to stay ahead of. 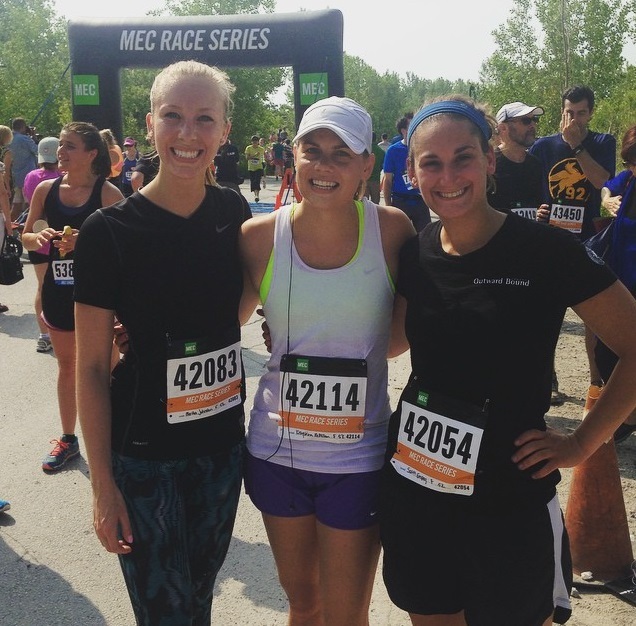 Our missing friend (who joined us in an earlier race) opted out after a crazy work schedule and a lack of training convinced her that she shouldn’t spend the money to run a subpar performance. I know how that goes, and up until this current streak I am on, getting to the starting line was a huge challenge in itself. Either way, I’m still the reigning leader of the pack. A race really breaks up a training program and helps re-frame your perspective and gives you a fresh start without ever having to break. I’m excited to get back to work and improve on my time again. I would love to take another 13 seconds off my time but three weeks isn’t really that long. And 13 seconds is pretty long. I actually only have two weeks to train because the week prior to racing isn’t meant to be much more than rest and maintenance. It is a week meant for staying safe and avoiding people who may push shopping carts into you or may wander into your path without warning and force you to dive around them on sidewalks. The week before is for wearing a crossing guard vest and screaming when people come too close to your bubble. … Oh, that’s just me? It has been a long time coming to get me to where I am now. It was a year and a half off running followed by a triumphant return to running which was quickly dismissed by a dislocated kneecap and accompanying torn ligament. That was eventually followed by a painfully gradual and much less triumphant return to running (again) which turned into this streak I’m on now. Just because the process isn’t glamorous, doesn’t mean the result can’t be glorious. Strategize for next race: check. Celebrate the little victories: check. The confidence that I had in my fitness a few days ago is now as unstable as my knee, wavering in a stiff breeze. Since I am still two and a half weeks out, I am reconsidering my my race prep strategy. It is definitely a heavy schedule and I think I might have given myself a little much credit to think I can conquer and thrive with this program. Last week I did two workouts a day, twice, just to fit it all in around my clients, but that resulted in runs ending early, running too slowly, or just putting myself through unnecessary pain for mediocre outcomes. It also resulted in me barely being able to keep my eyes open past 5pm. Throughout the week, I was happy with the effort that I was putting in, but when it came time to run a 5km (yesterday’s planned workout), I was too burnt out from my workouts for the run to come together as planned. My 5km turned into a 4km in 20:10; I guess I would rather run a decent 4km than a bad 5km. It’s not like I should practice gutting out that last kilometer in preparation for the race or anything. In a race scenario I would be asking a lot of myself to get through that last kilometer with my fastest pace with these type of training runs. Just because I am confident that I am capable of a sub 25 probably doesn’t mean I should get comfortable and train like an idiot. I haven’t actually made any changes to my programming yet, but I think I’m asking too much from my body. It does seem to be a trend that no one else thinks my muscles are as big as I do, so maybe I should step back and re-evaluate. I have convinced myself that any inactivity could give my knees a chance to go back to their old ways of getting all bent out of shape. So instead of listening to my body I’m just trying to keep things moving aggressively. Logical. A rolling stone keeps rolling faster, and faster, and faster. As long as I can squeak out my sub 25 run in 19 days then I will consider myself to have been successful. 22 days until the first race of the three left for me this season. This is approaching the time when my body starts red lining, kneecaps start dislocating, and tendons start popping. Historically speaking. For once, I actually feel quite prepared and I’m three weeks out. I only have to take 3 seconds off my last race time to get sub 25, and I am absolutely 3 seconds stronger than I was in June. Three times less stressed, and with three times more free time. Still warped, and still asymmetrical, but maybe I’m finally making it work for me. And now I have a secret weapon. One of my super generous friends gave me a steep discount on a GPS watch and I am now the proud running partner of a TomTom. In the setup process, the first step is to name the watch, which I assume is to write “My name‘s Watch” so you can claim some sort of ownership or some return to sender information. Or to rush through to the fun part where you actually get to use it. In line with none of those strategies, I named my watch Norman because that was my stereotyped name of someone who is as excellent a mathematician as this little guy. Running with instant feedback is such a luxury, like having a coach that will tell you how you’re doing but only if you care to know. So you can verify when you actually are running as slow as you feel, or you can confirm when you are going at a pace that you really can’t maintain. Onward and upward, overthinking it the whole way! Me and Stormin’ Norman are on it. As another race day comes and goes, another start line is approaching in the distance. After a sub- par performance at a 5k race last May resulting in a 25:45 finish, I was not particularly impressed with my time. Neither were two of my friends, K and S, who I used to run against back in the day. The days when we absolutely flew with unappreciated athleticism. Once they had finished reminding me how slow I had gotten (as all good friends should do), I challenged them to test their current cardiac output. The course was flat, the sun was out, and the light breeze against us on the way out was a fresh reminder that we would have the wind at our backs to the finish. We started close to the front because I will never again zig- zag a 6 minute kilometer trying to hurdle children, sidestep strollers, and be called “too aggressive” for a race (The Pace to Race). When the gun went off, there were only a few mild swerves needed to get onto a clear path and I was good to go. Beyond the start line I didn’t know where K or S was, but just nearing the 1km mark I saw some waving arms beside me and looked over to see K settle in at my side. We ran in silence, knowing we had both set goal times that were not achievable with wasted breaths. At the first kilometer marker, my watch blinked 4:52 to which I clapped and gave K a big thumbs up. She had headphones in and I didn’t catch her attention so I just settled back in and rejoined her in “the zone”. We continued on in silence, other than a “Well, that’s pleasant” comment from K when we got hit with a wall of animal droppings/ sewage/ nuclear waste odor. Kilometer 2 came at 9:57. Approaching the turnaround, K said she was going to have to slow down but she didn’t seem to drop off so I thought it was more of a warning than a factual statement. We rounded the halfway pylon at 12:36 but I wasn’t panicking, yet. K slowly started to fade back and I kept moving with increased fear of one of them catching me, now that I had put some space between us. There is absolutely a mental advantage to running with your competition. It is much scarier to not know where they are and to have to set the pace rather than hold a pace. Ego is on the line, here. The next kilometer was my slowest; I think I got a little too comfortable which would have be great if it was a race longer than only 5 kilometers. But it was 5 kilometers. You don’t get comfortable. I hit the 4 kilometer mark solo with a sloshing sound echoing from my stomach and cheesy motivational sayings starting to cycle through my head. I tucked in behind a woman with a blue tank top and an indistinguishable tattoo on her shoulder and just wheezed annoyingly behind her. There is no bodily sound that is embarrassing enough to deter you when you put your “fastest” reputation from a decade ago on the line. 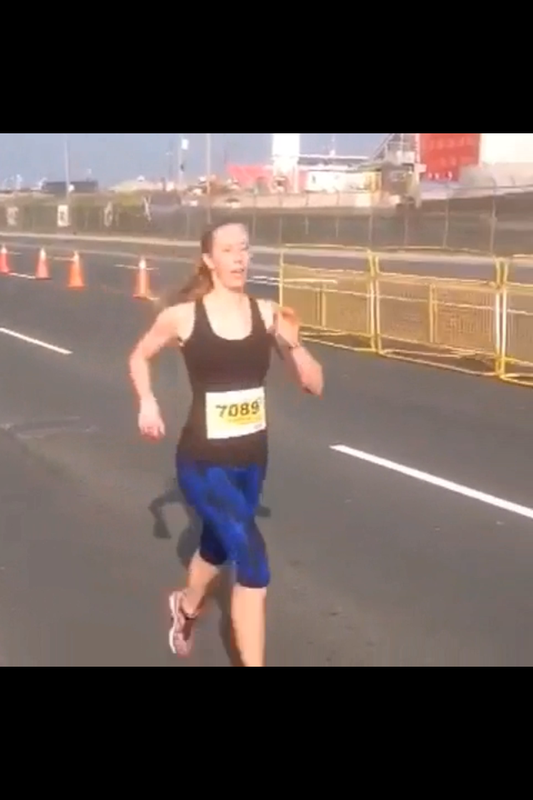 The 4 kilometer sign coming and going meant that I had to run a 4:45/km pace to get me to the line in time. I ended up passing the tattooed blue tank top wearer and crossing the finish line with what felt like an optimal combination of strength and fatigue. The woman I passed actually came and found me as I was wandering and panting in the finish area and gave me a solid high five. Bam. No words needed. I love the running community. My chip time was 25:03, which was four seconds slower than my goal of 24:59. That stings a little but I now have the confidence that I can run a sub 25 minute race; I just didn’t do it today. Today’s run was a full 42 seconds faster than my last race and I’m absolutely on track to get some great times under my belt by the end of this racing season. The summer of the 5k continues! 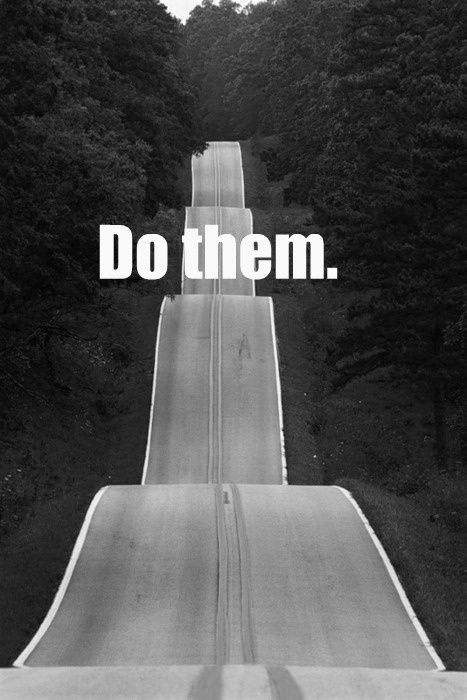 I have finished my last hill workout for the week. The countdown to race day is almost all counted down! 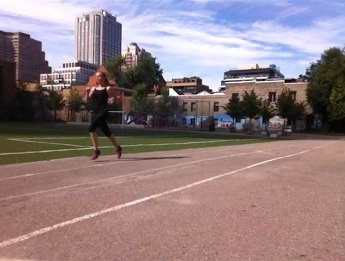 I left the gym at a nice trotting speed, warming up as quickly as my tin- man joints would unhinge. A lot of sun, a little breeze, and the weightlessness of the first few minutes of a run is a feeling I’ll never tire of. About a kilometer from work there is a notorious hill known to runners, cyclists, and any drivers who have attempted it in the Canadian winters or in standard cars. I headed in its direction to see if it it had lessened with environmental wear and tear, a change in gravitational pull, or even continental drift, perhaps. When I reached the base of the hill, there was a man running ahead of me and I thought to myself how tired he looked and how much he must be dreading this ascent. I was feeling (moderately) fresh as a daisy so I casually waited at the bottom until he had neared the top before I began. I didn’t want to pass him and make him feel bad, of course. Well, guess who felt bad when he turned at the top and came back down to run more hill repeats; completely the same workout as me. But with an Ironman t-shirt and Ironman tattoo. Not sure I placed my pity appropriately. I ran my first uphill and as we passed each other halfway we did the customary acknowledgement of each other’s presence on Earth with a half- second of eye contact and the accompanying head nod. Quite generous for Torontonians who customarily put their weight into smashing shoulders on sidewalks, but we are runners after all. As I cruise back down in my recovery period, I pretend to be super casual and not wheezing like a dying hyena as we pass and he knocks out another hill repeat. We upgraded to the smile and nod this round, appreciating our common “enjoyment” of running up hills. I notice that he looks much less tired up close and I doubted my own sweaty, tomato-red face was giving the same impression. Two rounds later, I’m trying to get myself back to the top again and I hear a “Looking strong!” and I look up to see that my running companion has now become my cheerleader. That little ego boost definitely gave me a push to the top of the hill and as we both switched directions again, I made sure to clap and cheer as much as my breathlessness would allow. As we alternated turns running, it turned into a cheer- fest and definitely an experience in the reliable friendliness of the running community. Halfway up his last hill, my new friend stopped to let me know this was his last one and he ran off into the sunset. Well, it was 1pm. But you get the idea. It’s like the Universe is cheering me on, now. On to race day! I can successfully add another pain- free run into my workout log this week. I ran 20 minutes of intervals alternating 1 minute hard with 1 minute easy. Tomorrow is leg day so I don’t plan to run again until Sunday, which will give my hips and knees two days to migrate back to their anatomical homes. My workouts include more time on my rehab exercises than anything else which ironically seems to invite insults about me “slowing down”. This is actually a scientifically proven way to help me run faster, but that’s cool too. My next planned/ anticipated/ oh-my-gosh-please-don’t-get-hurt race is one month away. Yesterday I was telling myself not to stress because if I’m not ready or if any (enter assorted body parts here) aren’t up to it then there is no pressure to race and I will continue to build to the next goal. Right on cue, I wake up to a message from a friend that I used to race against saying, “Did my first 5k in while – 30:32, will see if I can bring my time down to run with you”. Rather than start a discussion about her previous insult to my 25:44 time, I welcomed her friendly competition and encouraged our old running rivalry back to the roads. It didn’t take long for another old friend and fellow runner from my cross country days to chime in and say she could run it in just over 25 minutes. It is starting to look like we might have a little race here. Nothing more motivating than risking your title of being “the fastest”; a title which has been untouched for a decade until I asked people to challenge it. Time to channel my inner child and run like I’ll get my name on the announcements tomorrow. Once my knees remembered that they are 27 and not 87, I opted to run today and start back into a more goal- oriented workout schedule. I headed out into the sunshine and relatively fresh air (it is Toronto, after all) and started off with the intention to run 20 minutes easy, followed by 10 minutes at a 5k pace. Somewhere, the running gods were having a great laugh at my expense. I felt exhilarated to be running again; with the cool wind at my back, the sun in my face, and the musical serenades of obnoxious, beat- driven dance songs in my ears. I planned an out and back course and felt great until about halfway, when the sun started feeling a little too hot and perfectly timed, an elderly woman told me “I wish you wouldn’t run in this heat”. I gave a friendly smile back to her concerned scowl, but saved my breath for the way home. I changed my plan to just run for 30 minutes because I was anticipating that my threshold pace and my easy pace were one and the same today. I imagined that at 20:01 I would lurch forward and catch myself, falling back into the exact same pace. No extra energy to waste on that one good stride today! It was just a little heartbreaking that my easy pace was actually a few seconds per kilometer faster than my race pace two weeks ago, but not to worry, I knocked that out of my system and dropped down to somewhere around a 5:30/km pace. The only time I got close to my wannabe 5km pace was when I saw a sprinkler and actually chased the stream of water (which I did not catch up to) so I then casually came to a pause (shamelessly stood on someone’s lawn) so that I could not be missed this round. The rest of the trip home was slow and hot, a drippy combination of sweat and hose water. But it happened, and 30 minutes came. It is hard to be disappointed with any run at this point so I’m eagerly looking ahead to the next one. I have to catch that sprinkler. Last Sunday was race day. It was not as fast or as glorious as I had hoped it to be, but I finished the race vertical and left inspired to work harder and come back faster. So I think I can check that off as a success in one way or another. As much as I would love to list my excuses for not hitting my goal time in an attempt to justify that it was the Universe’s fault, I was happy with how I ran four of the five kilometers. The first kilometer did me in but it was a learning experience. Or a reminder, anyways. I could list all of the training runs I did in faster times, all the intervals I ran, and tell you about the days I didn’t feel like running but did it anyways. It doesn’t matter how good the workouts are if they don’t build on each other and if they don’t come together. In this case, neither of those may be the issue but my body just couldn’t do it. The bar is set at 25:44. And now I’m going to smash it. I have three more races planned this year, because if I don’t keep challenging myself then how will I know what I can do. I am not running how I want to, but I know where I want to get to. My goal is to stay injury- free to race June, August, and October and improve on my time each run. This week I have eaten so much chicken, I expect Loblaws to turn me away like a poacher walking into the zoo. Or I will have to buy my next armfuls of chicken among the whispers and rude stares of other chicken- less grocery goers. I have reached the realm of pre- 9am chicken, and on some days I even continued to put it down for every other meal. Dedicated to the diet, some might say. When actually, chicken was on sale and I bought excessive amounts apparently forgetting that I am cooking for one. And forgetting that I’m really not a big fan of chicken. I have always been a sucker for a sale, but that is often much more shoe related and much less chicken related. Luckily my workouts this week have been heavy and I have been working hard so the repetitive force feeding should be going to good use. Also, I am two runs closer to however many runs I’ll get in before I race. I have no game plan for my race prep which is not my style, but since I finished my school year less than a week ago, I have hit my stride at this ‘relaxation’ thing and gathering my thoughts is like herding cats. Today was a slow day at work and I had a long break early in the day. Chicken time. A gym member walked by and stopped to comment on how early it was to eat meat. “You must have been up real early”, she said. I had only been up for three hours, but I accepted the justification and ate on. Eating a lot is essential to gaining strength and size, but timing truly is everything. I can verify this with my personal experience of eating chicken breast, green beans, and broccoli this morning, (followed by an apple, a muffin, and a coffee) then attempting a 45 minute weight session followed by a 30 minute run. It was the unhappiest little chicken. After throwing around some heavy weights for an hour, despite the revolt of 2015 going down in my stomach, I got a solid 30 minute run in on the treadmill. After I finished, I sat down to refuel (turkey this time!) and I had a member tell me he never wanted to work out at the same time as me so he didn’t have to be so embarrassed about his own workouts. And just that like, it is all worth it. It has been a long time since I last wrote without the purpose being work, school, or dictionary- length to do lists. So once again I come back to my blog, my old friend who I have been avoiding only for productivity related reasons, I swear. It’s not you, it’s me. I am less than a month away from a 5km race that I signed up for after running for three 2- minute intervals and it seemed liked a good idea. It must have been the runner’s high. As of now I have one 5km run under my belt in a time of 26:07. At least I’m not risking over training and burning out. My post- surgery PB is 24:32 so that is my ultimate goal regardless of what my physio might tell you. I’ve got a ways to go but I’ve learned to never doubt what your legs can do on race day. Or maybe the lesson is to never doubt what your heart can make your legs do. 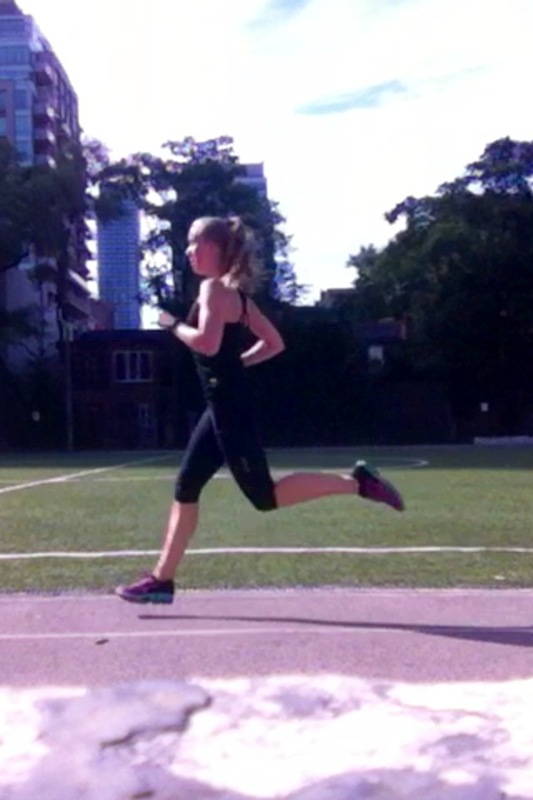 The weather in Toronto is still anti- running (says my inner 80 year old) and as much as I’ve always boycotted “riding the treadmill”, after several months of doing my best my hamster in a ball impression on said treadmill, I’m finding it hard to drag myself out in the blasting wind and freezing temperatures. Apparently missing outdoor runs has aged my attitude about weather by a few decades. Very fitting, as it now matches my 80 year old perspective on… pretty much everything else. April is a good time to re-evaluate your fitness goals for the year that you probably set in January with the best intentions but then forgot about at the first sight of cake. It is time to get out your thesaurus in an attempt to make your goals sound different than the unaccomplished attempts of January and get back on the horse. 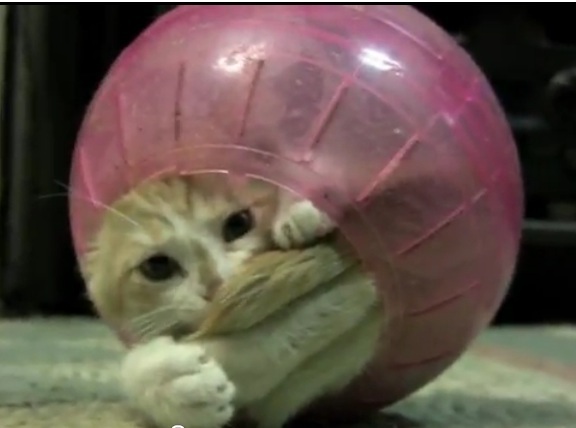 Or hamster ball, as the case may be. There is still a lot of 2015 to come; keep your eyes on the prize, my friends.